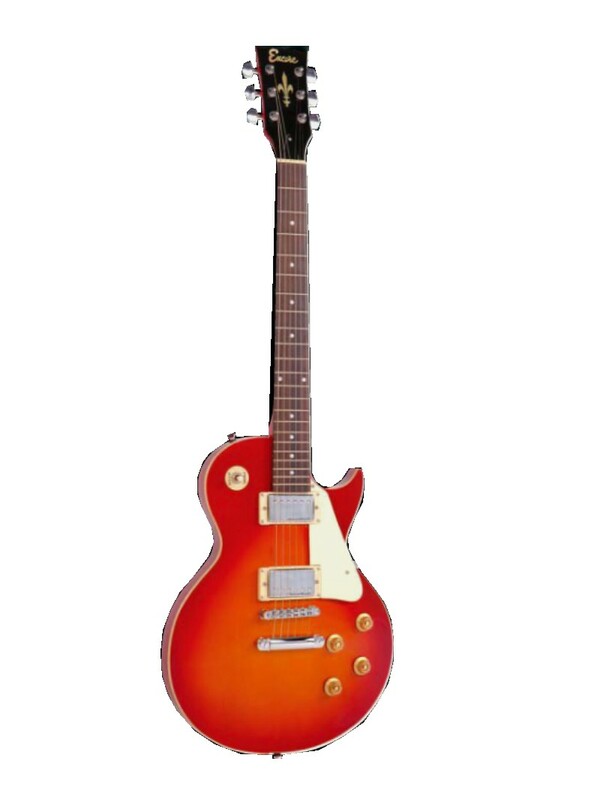 Here we have the Encoree E99 Les Paul electric guitar, available here in Cherry Sunburst Red - a dashing and vibrant colour choice for any rocker! This guitar would make the ideal exciting choice as a first serious rock guitar! The guitar features a fully radiused, archtop and contoured body, with a single cutaway for improved upper fret access. It also features a Tune-O-Matic bridge with adjustable saddles. The guitar has a medium depth maple neck with a gently radiused fingerboard, which means it suits all playing styles. The guitar has a scale length of 630mm, with 22 frets and a graphite top nut. It is also fitted with a solidly mounted stop bar tailpiece and two powerful Guitar Tech open double coil pickups. The guitar has enclosed machine heads for trouble free tuning and stability, and an easy access 3-way pickup selector switch. The cream scratchplate gives this electric guitar a vintage style feel, making it a classic buy. The guitar is also fitted with 2 x volume and 2 x tone controls.